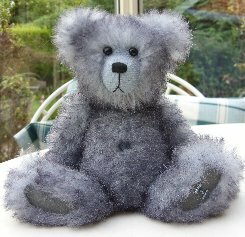 I completely adore this little bear, he is 7" tall and is called Wilkins, he is part of our Explorers collection. Wilkins is made of very, very soft, dense German alpaca in a lovely shade of denim blue tipped in darker blue. His pads and paws are dark grey ultrasuede and he has a black stitched nose and shiny black German glass eyes. Wilkins is very heavily filled with steel shot and steel balls, this combined with his loose joints, slight wobble head and incredibly soft fur make him a really lovely, cuddley bear. This style of bear has quite short legs with shaped footpads, curved arms and his head is set quite low on his shoulders which makes him look quite sad. He really is very cute, I do hope that you like him. Wilkins costs £56.50 plus postage. Please note that as with all our bears, Wilkins is not a toy and is not suitable for children. Sorry - Wilkins has been adopted.